This is a transcription of this speech made for the convenience of readers and researchers. No textual copies of the speech exist at the John F. Kennedy Presidential Library, and this short speech appears to be at least partly extemporaneous. This transcription is based on a Boston Globe article from November 9, 1960 and CBS News film footage housed at the library. Because there is no original textual source available to us, efforts have been made to follow John F. Kennedy's spoken words as closely as possible. In some cases this has led to apparent errors, where President-elect Kennedy's grammar becomes somewhat conflicted as he improvises his remarks. Ladies and gentlemen, I have received the following wire from Vice President Nixon. In that wire he says, "Senator John F. Kennedy, Hyannis Port, Massachusetts. I want to repeat through this wire the congratulations and best wishes I extended to you on television last night. I know that you will have united support of all Americans as you lead the nation in the cause of peace and freedom during the next four years." I reply to the vice president-- I sent him the following wire: "Vice President Nixon, Los Angeles, California. Your sincere good wishes are gratefully accepted. You are to be congratulated on a fine race. I know that the nation can continue to count on your unswerving loyalty in whatever effort you undertake, and that you and I can maintain our long-standing cordial relations in the years ahead. Sincerely, John Kennedy." 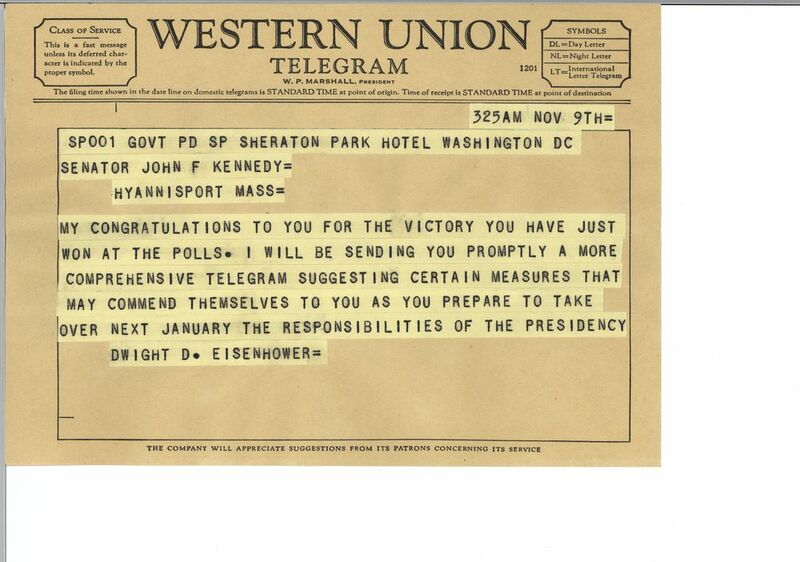 I received also a wire from President Eisenhower which says, "My congratulations to you for the victory you have just won at the polls. I will be sending you promptly a more comprehensive telegram suggesting certain measures that may commend themselves to you as you prepare to take over next January the responsibilities of the Presidency. Signed, Dwight D. Eisenhower. And I have sent to President Eisenhower the following wire: "I am grateful for your wire and good wishes. I look forward to working with you in the near future. The whole country is hopeful that your long experience in the service of your country can be drawn upon further in the years to come. With every good wish, signed, John Kennedy." May I say in addition to all citizens of this country, Democrats, independents, Republicans, regardless of how they may have voted, that it is a satisfying moment to me and I want to express my appreciation to all of them and to Mr. Nixon personally. I particularly want to thank all of those who worked so long and so hard in this campaign on our behalf and who were generous to me in my visits throughout the country and who were generous enough to support me in the election on yesterday. To all Americans I say that the next four years are going to be difficult and challenging years for all of us. The election may have been a close one, but I think that there is general agreement by all of our citizens that a supreme national effort will be needed in the years ahead to move this country safely through the 1960s. I ask your help in this effort and I can assure you that every degree of mind and spirit that I possess will be devoted to the long-range interests of the United States and to the cause of freedom around the world. So now my wife and I prepare for a new administration and for a new baby. Thank you.